Tired of clients calling you to change their thermostat settings in your cool home automation macros? You don't have time to piddle around with that, you have to sell and install complete new systems! Use this handy driver to let your clients change their home automation macros all by themselves. Sure it only let's your client write simple user home macros composed of system macros that you, the dealer, exposes to them but anything more complex and you want to make the changes yourself anyway. Your clients will be able to create scenes themselves. You set up Lights On, Lights Off, Lights Party Mode, etc. as well as AC Temp 72F, AC Temp 73F, Pool On, Pool Off, Spa On, Spa Off, and anything you can think of. Let your client make their own composition of Lights Off, Spa On, Romantic Music (a macro you write), and whatever else they come up with. You no longer have to be clairvoyant! 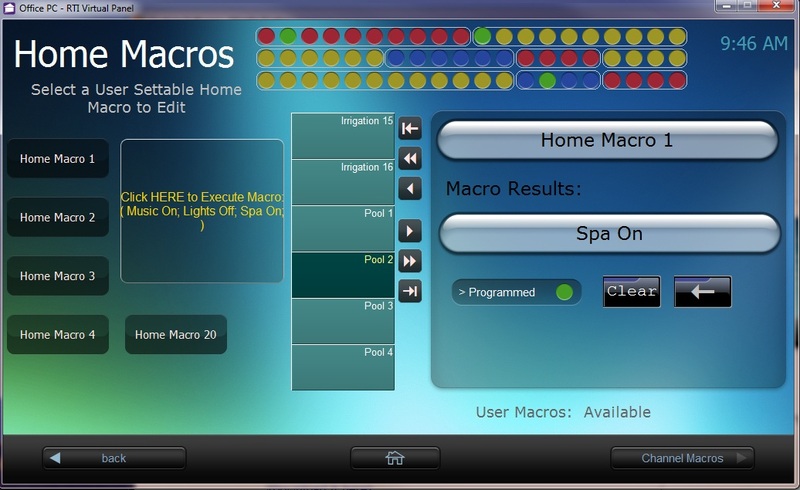 Start by writing the home automation macros for them and show them how simple it is to change them. They'll call you for advice once or twice and then they're off and running! You can test drive this driver on your RTI XP based processor for about 60 minutes after reboot without a license key. You'll want to use it on every remote once you see how cool it is! Please order the quantity based on the number of remotes, iPanels, Virtual Panels, In-walls and all remotes in the system.